Back to School, and Back to the Library! Are you ready for back to school? Get your children one of the most useful back to school supplies – a library card. It is a great way to start the school year with books and eBooks, at their fingertips. We also offer free Wi-Fi. Children can also use our computers for homework, with parental permission, when they are eleven (11) years old and up. Library cards are not just for kids! If you live in the Heyworth Public Library District, stop in and get your free library card today. Unlock your passion for books, audiobooks, movies, cake pans, music, and so much more. We are so much larger than our walls! Children age 3 – 6th grade may sign up and continue to read for the basic summer reading prize packet through August 31. We reserve the right to substitute prizes if prizes run out. We have 202 children signed up to read and 87 who have completed their hours! Let’s finish summer reading strong and kick off a great school year! The library is taking part in Chalk the Walks on August 14! We are inviting all local businesses and area residents to join in on the fun. Come help us draw inspirational messages and pictures for Heyworth students and their families to view as they make their way to school on August 16. You can start outside your business or home. TIP: Set out chalk on your walks for your employees, customers, and neighbors to add their own uplifting messages too! Chalk the Walks is all about spreading joy, optimism, and inspiration through the magical power of sidewalk chalk for a GREAT school year. September 6th we will kick off a new adult book club season. Books, Tea, and Conversation Club will meet at the library at 6:30 p.m. They will be discussing News Of the World by Paulette Jiles. August 23rd the Adventure Book Club will meet for 3rd grade – 6th grade students. They meet every 4th Thursday in the Community Room at 3:30 p.m. to discuss, create, and eat food that is mentioned in the books we read. We will be reading Rump by Liesl Shurtliff. Stop by the library and pick up your copy to begin reading this fun adventure. No library card necessary, but it is handy to reserve your book, audiobook, or eBook with a library card. We reserve multiple copies at the circulation desk the month before a book club is planned. Sign up is encouraged. A gift of a memorial or donation is a meaningful way to celebrate life or an occasion. Gifts to the Heyworth Public Library District support programs, collections, and services. With donations and memorials, the library is able to expand its collection and add programs for all ages. The library is recognized as a charitable organization by the Internal Revenue Service, in accordance with 170(b) (1) (A) (v) and 170(c) (1) of the Internal Revenue Code. A donation to the library is a gift to the community. Thank you to Nancy Beveridge for the gift of WWII magazine subscription, Gary and Carol Simpkins for their donation of many magazine titles given each month, and to Ellen Donovan for her memorial gift in memory of Pat Girdler and Daryl Cameron. The library greatly appreciates the gifts and memorials donated to the Heyworth Public Library. It is through these gifts and memorials that we can offer services and materials that go beyond the ordinary. For more information on gifts, memorials, or bequests, contact the director, Beth Porter, at 473-2313. Gently used children’s books to be given away on Halloween at the library instead of candy. Box Tops – Collection site for the Heyworth Organization of Parents and Educators (H.O.P.E.). 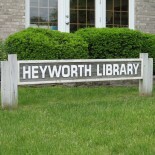 This entry was posted on August 7, 2018 by Heyworth Public Library District.